At this point we come to the end of the seven church paradigm which is primarily earthly in focus. In this chapter our eyes are turned heavenward to show us the heavenly elements involved in the judgment of the character and the behavior of humanity. “One thing will certainly be understood from the study of Revelation–that the relationship between God and His people is close and decided.”  The relationship between the seven churches on earth in chapters 2 and 3 and the things of heaven shown in heaven in chapter 4, chapter 5 and onward, will be seen to substantiate the truth of that statement. Now, John sees “a door . . . opened in heaven.” But it is not the “door” of Revelation 3:20 which is a metaphor for the heart of man on earth that only men can open. 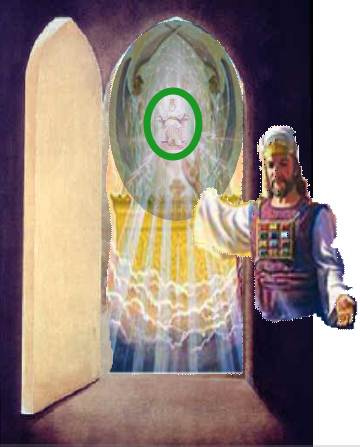 Rather, this is a heavenly “door,” the “open door” of Revelation 3:7, 8 which no man can “shut” or “open” in the heavenly sanctuary. Only Jesus, who has “the key of David,” is in control of that one. And so, we see Jesus directing John’s eyes heavenward inviting him to see “thing which must be hereafter” or, into the future, not only to John’s time, but, on into the time  of the Laodicean period of church history and beyond. Saying he was “immediately in the spirit,” suggests he was not “in the spirit” or “in vision” prior to this. However. ch.1:10 tells us he was “in the Spirit on the Lord’s day” and there is no evidence he was out of “the spirit” while the Lord was speaking to him in chapters 2 and 3. Later, John twice says he was “carried . . . away in the spirit” (Revelation 17:3; 21:10) suggesting a spiritual transport, in this case, from earth to heaven, but remaining in the “spirit” the whole time. Therefore, it seems this is his way of saying his view has now been redirected from the seven, earthbound churches, heavenward, in mind, at least, if not in body. The first thing he sees is “a throne” and someone sitting on it. Jesus had just referred to it as the “throne” where “even . . . I also . . . am set down with my Father in his throne” (Revelation 3:21). Therefore, this “throne” is shared between Jesus and His Father who is depicted in the next verse. Take note, however, that He is not being seated (or “enthroned”) anywhere in this chapter or in the next. Rather we see Him opening up the view of the “throne” in this chapter, and in the next we see Him coming before the throne and its occupant. The personal pronoun “he” is the only article indicating the occupant of the throne to be a person until we come to ch.5:1 where we see His “right hand” holding a “book.” This as much as we can see of the Father which is completely unlike what we see of the Son whose clothing, feet, chest, head, hair, eyes, face and mouth, including the sound of His voice were described in some detail (see Revelation 1:12-16). The only words John could use to describe the Father was to compare Him to the beauty and glory of precious stones, including a peculiar rainbow we have never seen, “in sight like unto an emerald” which is noted for its “green color”  in contrast to the multicolored rainbow we are familiar with. Nevertheless, it is just as indicative of hope and protecting care of God as was the “bow” was to Noah in Genesis 9:13. In another description, she “stated that a cloud of glorious light covered the Father and that His person could not be seen. I also stated that I saw the Father rise from the throne. The Father was enshrouded with a body of light and glory, so that His person could not be seen; yet I knew that it was the Father and that from His person emanated this light and glory. When I saw this body of light and glory rise from the throne, I knew it was because the Father moved, therefore said, I saw the Father rise. The glory, or excellency, of His form I never saw; no one could behold it and live; yet the body of light and glory that enshrouded His person could be seen.”  But, in spite of the Father’s invisibility, we will go along with the artist, in this illustration, who depict Him visually in order to conceptualize what John is saying he saw. Verse 4: And round about the throne were four and twenty seats: and upon the seats I saw four and twenty elders sitting, clothed in white raiment; and they had on their heads crowns of gold. This picture bears striking resemblance to what Daniel saw when he “. . . beheld till the thrones were cast down” around the throne where “the Ancient of days did sit” (Daniel 7:9). While Daniel did not enumerate the number of “thrones” nor the occupants, John saw twenty four “seats,” and twenty four “elders.” This is another example of the complementary relationship of John’s vision to that of Daniel’s. The golden “crowns” signifying victory  over sin, and are complementary to the white raiment. Therefore, although seen in heaven, these “elders” obtained their position, with Christ’s help, by overcoming in the same battle against sin that we face. Consequently, they are human beings, not angels. So, “if the 24 elders are human beings, it follows that they must be men already in heaven in John’s day. Adventists have often identified them with the saints who arose from their graves at the time of Christ’s resurrection (Matt.27:52, 53; cf, Eph;.4:8)”  some thirty eight years before John had this vision. Also, since Daniel makes no mention of them as such, we can assume they filled their positions some time after Daniel recorded his view. Although John fails to tell us where they came from, this statement is helpful: “As Christ arose, He brought from the grave a multitude of captives. . . . They ascended with Him as trophies of His victory over death and the grave. ” Very likely, the 24 elders were chosen from among those former “captives.” Why only 24? Why not the whole “multitude of captives”? Since this scene appears to be a gathering where “the judgment was set and the books were opened” in the presence of a “thousand thousands . 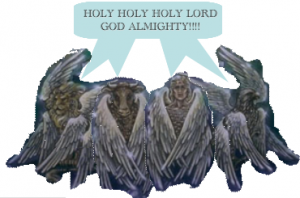 . . and ten thousand times ten thousand” (Daniel 7:10) of angels in Daniel’s vision, only 24 humans selected from the “multitude” of humans must be significant. Consider that the number “24” is a multiple of the twelve sons of Jacob, the twelve tribes of Israel, the twelve loaves of bread on the table of shewbread (Leviticus 24:5, 6), or the twelve apostles, etc. That being the case, “24” is double the number. Since the gathering depicted here is obviously a court scene, we can expect court regulations to apply. One that comes to mind is that “one witness shall not testify against any person to cause him to die” but “at the mouth of two . . . or three witnesses . . .” (see Numbers 35:30; Deuteronomy 17:6). Twenty four would satisfy that requirement. The rest of the “multitude of captives,” we can be sure were also present among the gathering of the angels for the judgment proceedings that were about to transpire. Daniel saw things similar to the “lightnings and thunderings” “out of the throne” when he commented that God’s “throne was like the fiery flame” and “a fiery stream issued and came forth from before him” (Daniel 7:9, 10) even though he said nothing about “seven lamps of fire.” Neither did John say anything about “his wheels.” Nevertheless, there are enough parallels in those two scenes to assure us that Daniel and John were viewing the same thing, which is further evidence of the complementary nature of the parallels in Daniel’s and John’s visions. 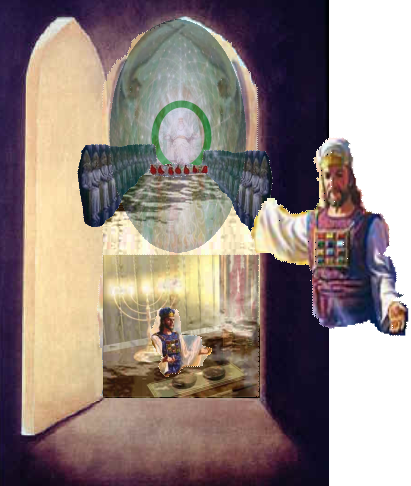 Therefore, the “seven lamps of fire [on the south side] burning before the throne [on the north side],” and God’s throne (represented by the table of shewbread) should be shown here in the first apartment of the heavenly sanctuary at this point instead of this picture which shows God’s throne in the second apartment. 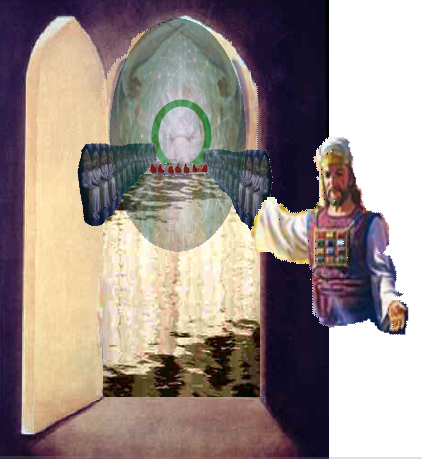 If that is the case, how can we be sure the antitypical day of Atonement, suggested by the “open door” of Revelation 3:7,8, and Daniel 7:9, 10 & 13, is being depicted? Evidence for some kind of movement from the first to the second apartment must be found; otherwise we shall be forced to abandon that assumption. Other than the “wheels” associated with God’s “throne,” coupled with the movement of “one like the Son of man [who] came to the Ancient of days . . .” and being “brought . . . near before him” (Daniel 7:9, 13), that is all there is to suggest a transition from the first to the second apartment in Daniel 7  and nothing at all in Revelation 4. But, chapter 5 will give us more information about the same movement we find in Daniel 7. Therefore, Revelation 4 and 5 give an expanded view of what Daniel say in his vision of Daniel 7:9, 10 & 13. But, these “four beasts,” that Daniel says nothing about, instead of “seven,” like the churches, are only “four,” an entirely new element in John’s vision. Note that they share the same space with the “Lamb” who is also “in the midst of the throne . . .” (Revelation 5:6). At first glance, we might conclude they must be “the seven Spirits which are before [God’s] throne” representing the Holy Spirit, the third person of the Godhead. For a parallel, go to Ezekiel where a “number of wheels of strange appearance, intersecting one another, were moved by four living creatures. High above all these was ‘the likeness of a throne, as the appearance of a sapphire stone: and upon the likeness of the throne was the likeness as the appearance of a man above upon it.’ ‘As for the likeness of the living creatures, their appearance was like burning coals of fire, and like the appearance of lamps: it went up and down among the living creatures; and the fire was bright, and out of the fire went forth lightning.’ ‘And there appeared in the cherubims the form of a man’s hand under their wings.”  The “man’s hand” must belong to One whose “appearance” was that “of a man,” the same Person who looked like “a jasper and a sardine stone” “upon a throne . . . set in heaven” in verse 3. Therefore, the “four beasts” must be the same four “living creatures”  in Ezekiel’s vision also called “the cherubims” (see also Ezekiel 10:1-20). Consequently, they are created beings, who in spite of being “full of eyes before and behind” implying the omniscience of the Godhead,” we conclude, because they are created beings, the four cherbum are “full of the” Holy Spirit from God the Father who provides them the power to see as He sees. Note that when the “first beast” invites us to “come and see” a “white horse” appeared in Rev.6:1,2. Then when the “second beast” says “come and see,” the “horse that was red” appeared in Rev.6:3,4. Afterwards, when the “third beast” said “come and see” a “black horse” appeared in Rev.6:5. Finally, when the “fourth beast” invites us to “come and see,” a “pale horse” came into view in Rev.6:7,8. The appearances of the beasts, as strange as they are, must be intended to convey something of enormous importance with regard to the judgment proceedings depicted in chapters 4 and 5 as well as in the ongoing scene in chapter 6. Three of these beasts were like animals while only one “had a face as a man,” suggesting that the case of humanity was the object in view in these symbols. John’s beast number three, with “a face as a man” was identical to Ezekiel’s that “had the face of a man” which must have been front or back because the left and right were occupied by the lion and ox faces. So, while John sees “four beasts,” each having one “face,” Ezekiel saw “four living creatures” each having “four faces!” (Ezekiel 1:6) each face having nearly the same features as John’s. Another interesting feature about Ezekiel’s creatures are the beautiful, intricate “wheels” with “one wheel upon the earth . 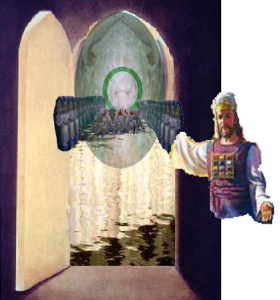 . . a wheel in the middle of a wheel” that “were so high that they were dreadful; and their rings were full of eyes” and go “up from the earth” with “a noise of great rushing . . .” (Ezekiel 1:15-21; 3:13). Without doubt, they are the same “wheels” (Daniel 7:9) Daniel spoke of in connection with God’s throne, confirming that the scenes described in Revelation, Daniel, and Ezekiel are the same. Although considerable similarity exists between John’s “four beasts” and Ezekiel’s “living creatures,” John’s had “six wings,”while Ezekiel’s only “had four” (Ezekiel 1:6; 10:21). Isaiah says he “saw also the Lord sitting upon a throne, high and lifted up, . . . . Above it stood the seraphims: each one had six wings; with twin he covered his face, and with twain he covered his feet, and with twain he did fly. And one cried to another, and said, Holy, holy, holy, is the LORD of hosts: the whole earth is full of his glory. And the posts of the door moved at the voice of him that cried, and the house was filled with smoke” (Isaiah 6:1-4). Therefore, if they are observing the controversy between Christ and Satan on the earth, their lion-like, calf-like, man-like and eagle-like appearances must have something to do with what they are seeing. When our study reaches chapter 6 verses 1-8, we will find that each separate beast introduces each of the “four horses of the apocalypse” with the invitation to “come and see.” Consequently, an important relationship must exist between those four horses and the four beasts that is not generally understood. 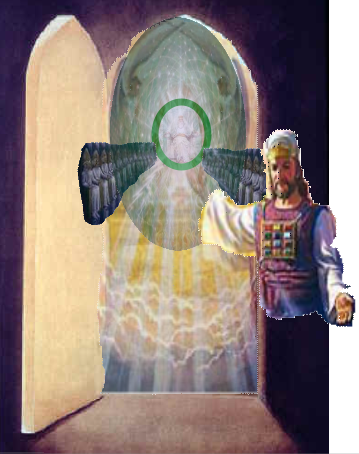 Remember, Jesus was showing John all this strange imagery, and what the “beasts” were doing as He conducted John in this tour of the heavenly sanctuary. Even though Jesus is not depicted with “him that sat on the throne” here, recall that He was “set downwith [His] Father in his throne” (Revelation 3:21) just a few moments before which must be the same “throne” depicted here. In other words, God the Father is center stage in this chapter, while God the Son was actually presenting the details of this scene to John personally. But, Jesus was always talking about “your Father which is in heaven” when He was on earth. For example He said “glorify your Father which is in heaven” (Matt.5:16) Also check up on Matt.5:45, 48; 6:1; 7:11, 21; 10:32, 33; 12:50; 16:17; 18:10, 14, 19; 23:9; 11:26 where Jesus uses the same phrase. So, His presentation of the Father in this scene is wholly characteristic of Him who came to bring honor to God the Father while He was on earth, and is seen here doing the same thing. Some believe that Jesus is not depicted in chapter four, but, as you can see, Jesus is the One with a “voice . 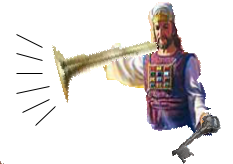 . . was as it were of a trumpet talking” to John as we learned in verse 1 saying “I will shew thee things which must be hereafter. That is why Jesus shows us the four beasts expressing adulation and gratitude, seemingly only to the Father rather than to Himself which is characteristic of Jesus who sought not His own glory (John 8:50), but leaves that to others to do later as we shall see in the next chapter. The next two verses completes the scene of chapter 4. Verses 10 & 11: The four and twenty elders fall down before him that sat on the throne, and worship him that liveth for ever and ever, and cast their crowns before the throne, saying, Thou art worthy, O Lord, to receive glory and honour and power: for thou hast created all things, and for thy pleasure they are and were created. The “intelligent beings” include the “four and twenty elders” who “fall down before” God the Father “when those [four intelligent] beasts give glory and honour and thanks to him that sat on the throne . . .” which depicts the “beasts” as leader in this doxology of praise. But, God the Father was not alone in His work of creation because He said way back at the beginning of time “Let us make man in our image, after our likeness” (Genesis 1:26). John also said “In the beginning was the Word, and the Word was with God, and the Word was God. . . . All things were made by him; and without him was not any thing made that was made. . . And the Word was made flesh, and dwelt among us, (and we beheld his glory, the glory as of the only begotten of the Father,) full of grace and truth” (John 1:1, 3 & 14). Therefore, God the Son and God the Father were both involved in the work of creation. It was not a One Man job even though, in this case Jesus is directing all the credit to His Father. But, that is just like Him. While He was on earth He was heard to say “the words that I speak unto you, I speak not of myself: but the Father that dwelleth in me, he doeth the works” (John 14:10). So, even though some believe Jesus is not seen in chapter 4, it should be obvious by now He was the active “behind-the-scenes” agent throughout the entire chapter revealing the wonders of the things depicted here. The same scene continues in the next chapter. Summary of chapter 4: Seen in the context of chapters 2 and 3 where the seven earthly churches are scrutinized by Jesus standing “in the midst of the seven candlesticks” in Revelation 1:13, the “door . . . in heaven,” in this chapter, it must be Jesus Himself, noted in Rev.1:10, to have “a great voice, as of a trumpet,” who opened this “door.” His trumpet-like voice is heard inviting John to “Come up hither, and I will shew thee things which must be hereafter.” Referring to the parallel scene in Daniel 7:9 and 10 where “the judgment was set,” we see God the Father on His throne with “thrones . . . cast down” around Him, and likewise here in Revelation 4 we see 24 elders seated around Him plus four strange beasts “in the midst . . . and round about the throne.” They together with the elders bow in humble, joyful adoration of God the Father because He “hast created all things, and for thy pleasure.” Since seven lamps of fire are seen positioned before the throne of God in verse 5 which must be equivalent to the seven branched candlestick located in the first apartment, we can assume this is where Jesus took up His ministry in the heavenly sanctuary following His resurrection and ascension into heaven to take up His duties as our High Priest. 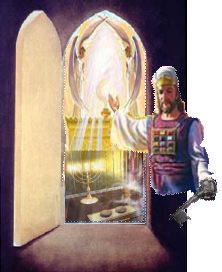 When John saw Him in this marvelous vision, He had been ministering there for more than thirty years. Therefore, this is not His inauguration into His priesthood, but a look into what He had been doing for some time. The fulfillment of Daniel 8:14, when the sanctuary would be cleansed, was not to take place for another 2,265 years from the time John received this vision. Before that time, Jesus had remained at His post in the first apartment ministering to His church on earth. But this chapter seems to be setting us up to witness the movement in heaven to inaugurate that very thing. The next chapter, which continues this scene, will tell us much more. See SDA Bible Commentary Vol.7, page 767 (left column under “The first voice.”) The Commentary argues this to be a “second” vision where I see it as a continuation of just one vision from the beginning of chapter 1 to the end of chapter 22. The Commentary’s remarks on “Hereafter” is that it “is, not necessarily after the fulfillment of the previous vision, but from the standpoint of John’s own time.” (ibid) From my standpoint, “hereafter” should be considered as following that of the seven churches in general, and Laodicia in particular, and not a throwback to chapter 1. 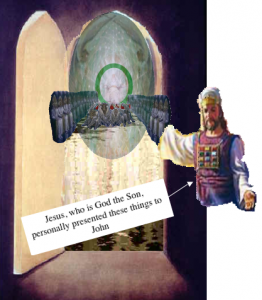 If John’s vision was given in 69 AD, and Christ’s ascended in 31 AD, 38 years had transpired. Mrs. White assures us that Daniel 7:13 “is not his second coming to the earth, He comes to the Ancient of days . . . to perform the work of investigative Judgment . . .” (see Great Controversy 479, 480) As far as I am concerned, that statement is conclusive.